I read a review of this wine somewhere – I forget where. It was glowing. 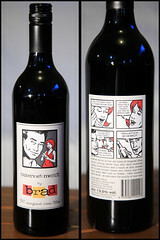 And with the wife having Merlot as her favourite varietal, I knew I had to find some bottles of it. 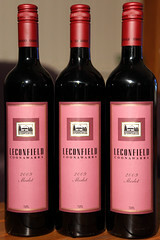 Our local wine shop had Leconfield’s Cabernet Sauvignon and Shiraz, but no Merlot. I found a shelf label for it at another bottle shop, but they’d sold out. However, they managed to order some in and I grabbed them. This was something else. Let’s start with the colour. It’s a deep, rich purple garnet colour, thick and opaque. This is the colour of wine a vampire would drink. It felt heavy in the glass. I know I’m probably imagining it, but this wine exuded a gravity and presence just by looking at it. The aroma was pretty much what I’ve come to expect from a Merlot by now. A berry-heavy fruitiness with a whiff of alcohol. Honestly I didn’t get much out of the smell beyond that, but I still need practice on the reds. The flavour. Wow. The first thing you notice is the richness and roundness – it fills the mouth. It makes you want to talk in plummy English tones like Professor Henry Higgins. It has a real solidity to it, but velvety in softness. 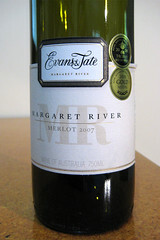 The taste was blackcurranty, maybe some dark cherry, a bit of plum, and a distinct hint of mint. 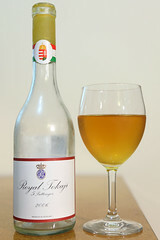 There was some tannin there at the end, but soft and smooth, not harsh, creating a nice dryness in the mouth. 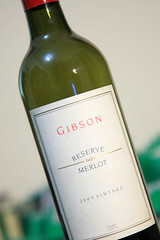 Even in my limited experience, I could tell this was something a step above any other Merlot I’ve had before. Really good. I might try to grab a few more bottles, and hang on to some for a few years – the label recommends cellaring for 5 to 10 years. I imagine it will be brilliant then.